Genomics – in general – is the study of a complete set of genetic material (DNA), and when it comes to cancer research, studying DNA is crucial. Cancer develops when DNA becomes damaged or changed. 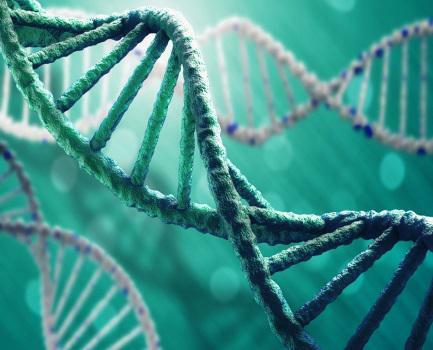 Some cancer-causing genetic changes are inherited, while some come from exposure to chemicals (such as those in cigarette smoke), radiation, certain microbes or other environmental factors. Studying cancer genomics involves exploring the differences between cancer cells and normal cells. There’s a paradigm shift taking place: We’re moving from an organ-focused (type of cancer) approach to a gene-focused approach. This shift is already having a profound effect on the way cancer is treated and allows doctors to provide more individualized options for patients (also known as precision medicine). In addition to the specific projects listed below, genomics research is part of the work being conducted by every scientist NFCR funds. For many years, NFCR has distinguished itself from other organizations by emphasizing long-term, transformative research and working to move people toward cancer genomics. One of the most fundamental questions facing scientists today is how seemingly normal cells become cancerous. To better understand how this happens, Dr. Paul Schimmel has dedicated more than 40 years to examining the minute forms and intricate functions of molecular biology. In 1983, Dr. Schimmel developed the concept for what are now known as ESTs (expressed sequence tags) and the strategy of shotgun sequencing. These approaches were later adopted in the human genome project. In fact, his work on the development of ESTs is known as one of the four key developments that launched the human genome project. Dr. Wei Zhang has devoted his entire career to the pursuit of precision oncology – specifically to the key molecular and genomic events that drive the development and progression of cancer. Over the last 18 years, Dr. Zhang and his team have identified multiple novel cancer markers and oncogenic signaling molecules.